Everyone loves a good Before & After right?! Especially one that doesn’t cost a fortune to recreate! I had a completely different plan in mind for this little dated kitchen going into the project. All I knew, was that the wood had to go. Now don’t get me wrong. I love a good wood (key word “good”) cabinet as much as the next person, but I think I went into wood shock going into the original space. EVERYTHING was the same shade of eh brown. And the room felt eh. The original plan included an all white kitchen. Light & Bright. It needed it. But then… I started painting the walls with Glidden’s Almost Aqua (pretty mix of minty & aqua) & realized the wood was taking three coats to cover. With Primer! SO… I changed my mind & used my go to favorite door paint for the kitchen. Rustoleum’s Door Paint in Satin Black. One Coat & DONE! That is what I needed as I didn’t have enough time to wait for three plus coats of paint on my timeline. 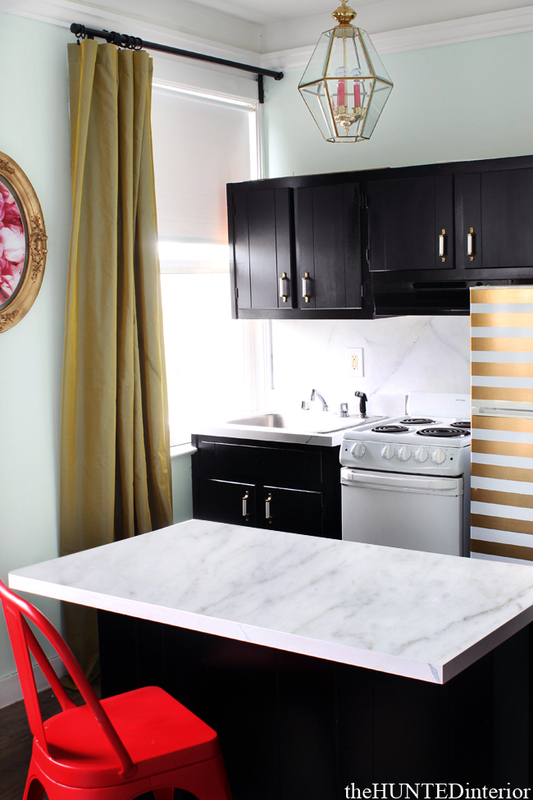 Once I added my new favorite pulls to the black cabinetry I knew I made the right decision. D Lawless Hardware was kind enough to donate all of the hardware for the project!! But want to know the best news… If you love these pulls as much as me, they are only $0.99 a piece. I know. Crazy right?! The counter was a bit of a no brainer for me. 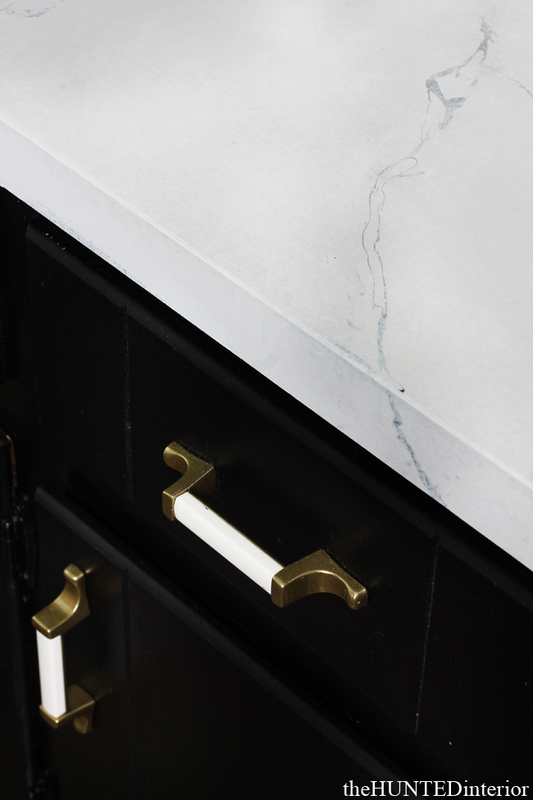 I saw the boring scratched white laminate top & instantly thought of Danika’s Countertops over at Gorgeous Shiny Things. I had painted faux carrara marble before on our old coffee table & was really happy with the outcome, so I knew I could duplicate the look for next to nothing in this space. I already had all the paint anyways…. Danika’s tutorial is stellar! 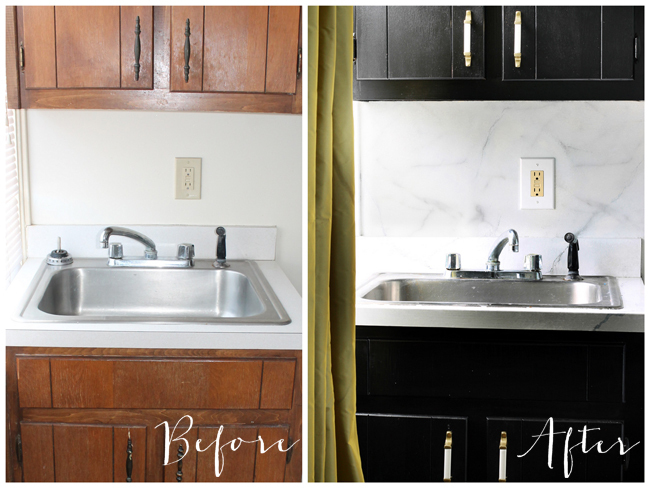 So if you think you want to attempt a countertop overhaul you really must check her out. Rockstar. The kitchen was looking good, but it needed something… so I tried something… something I never thought I would have done before… I put Duct Tape on a fridge. In my defense, it was gold… so I was already a fan. It also covered up some not so lovely stains on the fridge. And if we are being honest… I literally could not paint one more thing in this place! I was painted out!! So I went at it. Now do as I say & not as I do… because I didn’t even measure these bad boys out. I simply attacked it with the tape & was done in mere minutes. It is a really fun (& non permanent!) solution for a fridge that is dated or worn. This would be a great dorm room or renter’s solution for sure. Home Decorators Furniture donated the perfect chair for the space. 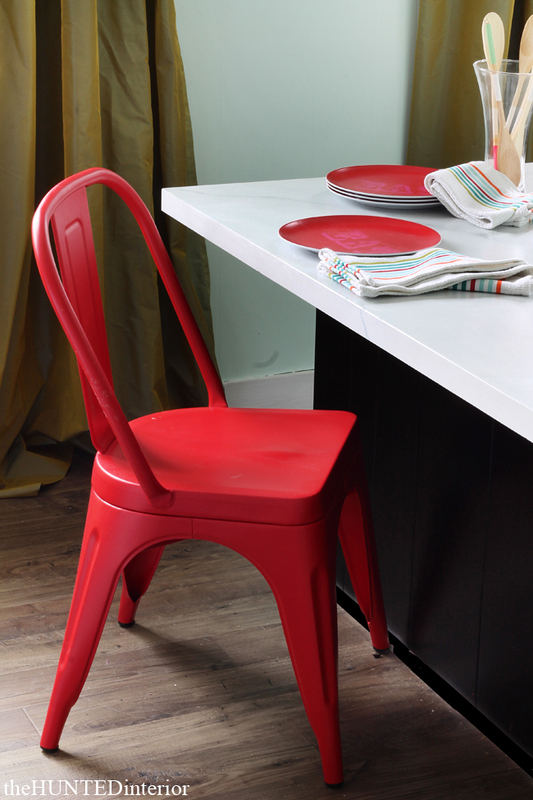 Their Garden Side Chair in Red was just the hit of industrial vintage the room needed. The fact that it is metal provides another texture to the space too. Not to mention this chair is super easy to clean. I love how this brings a punch of red onto this side of the room. It really ties the spaces together. 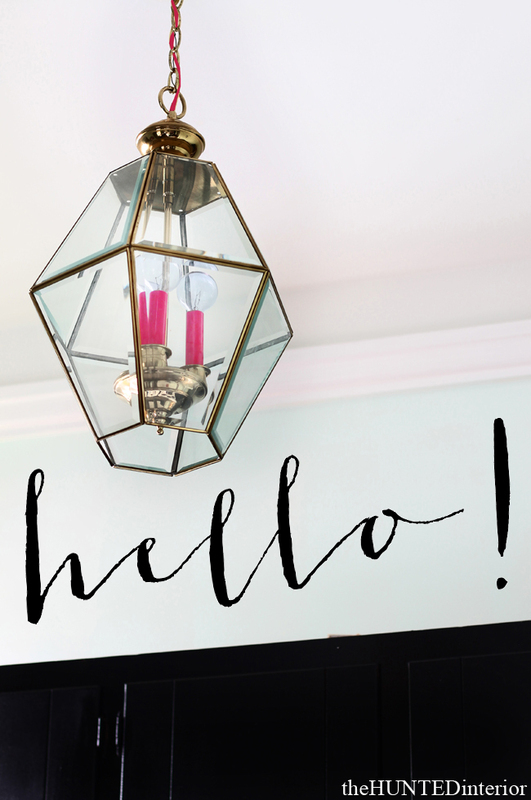 The last item added to the Kitchen Area was the light fixture… Bye Bye builder grade boring & say “hello” to the updated old foyer light. It really fit the space well & when the light is turned on it casts some really killer faceted shadows. Has anyone followed the easiest tutorial ever for this Goodwill find?! Including the monetary value of the donated items the total cost for this space was under $175… The power of the right items & a little hard work. Art anyone?! All the details tomorrow. To read more about Room Service Atlanta & the United Methodist Children’s Home please follow this link. A. Mazing. Balls. 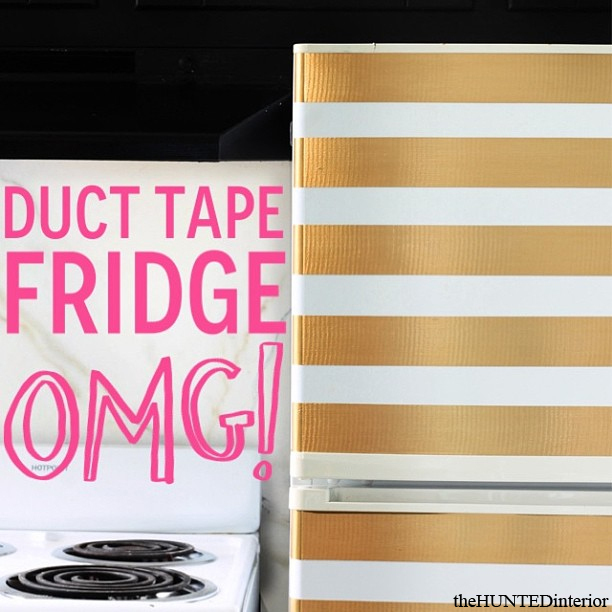 Seriously…Duct tape fridge. Dang that is smart. Love it all. Love the black cabinets! 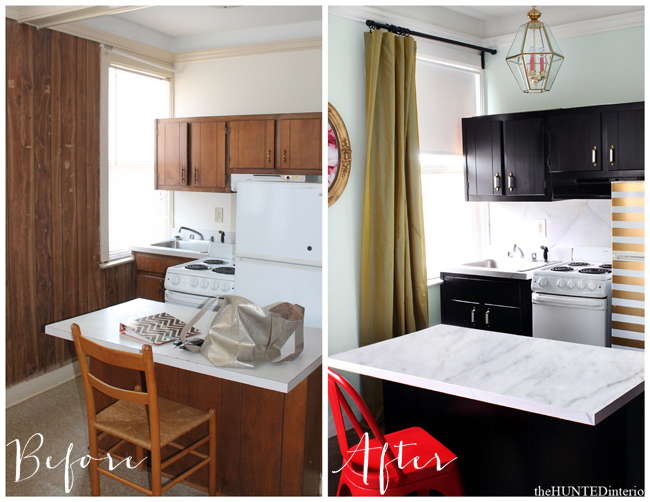 Wow – I'm amazed at how the black paint totally transformed those terrible cabinets. And gold duct tape on an old white fridge, amazing! Black, 'marble' and gold = heaven. Love it! You kill me! It is so awesome. I can't believe you put duck tape on a fridge.. but it works! This is super fab!! I pinned it for inspiration in my next kitchen re-do!! LOVE it! I can't decide what element I love more. Taping the fridge is genius! Did you just tape the door or the sides also? I can't tell by the pictures. You did such an awesome job in this space. I love the cause, and what you pulled together with creativity and a thrifty eye will really brighten up someone's life. Amazing! You never cease to amaze! Everything looks amazing! The duct tape is perfectly genius, love it girl! OMG incredible. And how convenient, I have a sad fridge too! Amazing stuff, Kristin! You are so so inspiring! It looks great! $175?? holy monkey. This should truly inspire anyone to make their own spaces a little prettier. You did an amazing job! The fridge is genius and I was already eyeing up mine! Ok that fridge is awesome and so fun, and the marble paint treatment looks fantastic! Squeal!!! that fridge… i die! no seriously! and i just saw your headboard and art! you and i are on the same page design wise right now and i wish you lived here so we could squeal like school girls over gold stripes and polka dots! weeeee…. Wow, I must say I'm impressed! You did a lovely job and I still can't get over it only cost you $175!!! Just shows what some imagination and elbow grease can do. Well done! Super impressed and in love Kristin! This really is fantastic. I wish we could see footage of the lucky girl who gets to stay here walking in for the first time (a la HGTV/TLC reveals). I think they would squeal with delight. I would! I would love to know where the curtains are from. Oh my goodness, this makeover is fantastic!! FABULOUS!!!!! I would also love to know more about the curtains – taffeta? Its a great color with the gold! FABULOUS!!! I would also love to know more about the curtains in the kitchen – taffeta? Looks great with the amazing duct tape fridge! Your faux marble is ridiculously spot on! You need to come to my place and do that. And that hardware fits right in. Wish I hadn't already purchased mine! Oh my God, EVERYBODY has that foyer light, don't they? I love what you did to it! You are amazing woman!!!!! So pumped you liked the tutorial and your counter is perfect! The gold duct fridge blew my mind- you knocked it out of the park. Major blog love for you! XO Keep inspiring! I love the kitchen redo it looks soo much better! 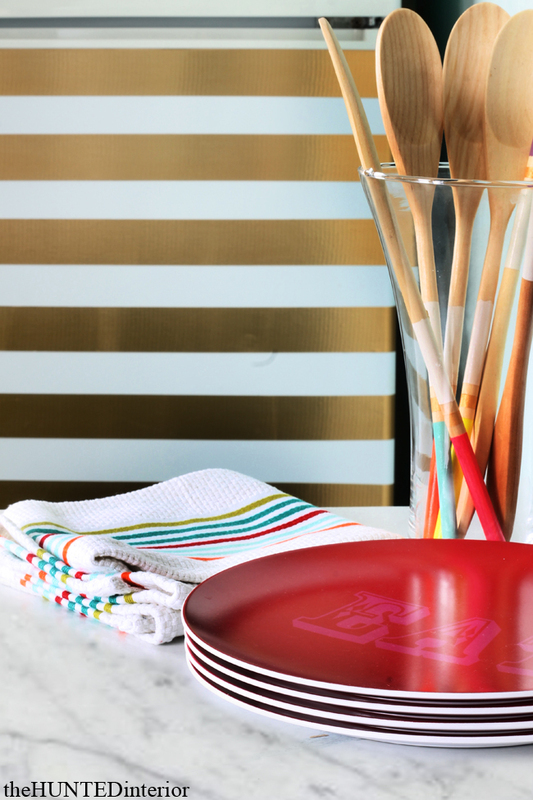 I'm in love with the dark cabinets the gold stripes and the bright pop of red in chair form! Great job on this and the entire project! 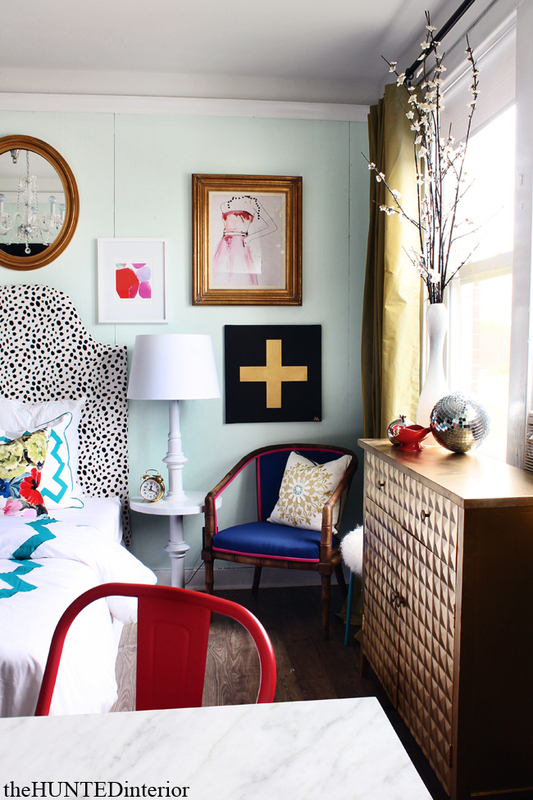 this is a fabulous makeover and I am so inspired! Bold you for duct taping the fridge! LOVE LOVE it. Gotta marbelize my countertops. Stat!